The 2010 general election is definitely upon us – I don’t care who you are, if you’re a British citizen (asylum seekers and illegal immigrants are exempt; they’ve got bigger issues at hand) and you’re unaware of the general election furore at the moment you’re either extremely vacuous or simply apathetic, and possibly a bit of a nihilist. In an observational piece written co-operatively between AA Gill and Jeremy Clarkson (I personally never considered the two minds to be of a mutual capacity), Clarkson recalls a teenage girl, aged 18, who perceived herself to be too young to take part in the franchise which is legally hers to be a part of. This is an example of both vacuity and apathy; the girl is stupid for thinking she’s too young to vote, but also apathetic for not researching the requirements. It wouldn’t be hard for a politician to ditch the comfort of his or her desk chair arse print and discover just how many young people go unaffected by this turbulent political torrent in our midst. My own older brother, a man of great intellect (I say impartially, as it is indisputable), admitted to me he never votes, but has contemplated doing so for this particular election – I won’t state his inclination, despite how transparent it is given the previous 13 years of new Labour. But in all fairness I can’t go about smearing the likes of non-voters or the denser minorities who perhaps don’t even know there’s a race for power in progress. At this sluggish point in the massive election campaign I wouldn’t dare point the finger at someone showing no signs of enthusiasm for its purpose; truth be known, this election has lost its impetus. Take a leap backwards in time to a few months ago, before Gordon “robot” Brown had even announced the official date of the general election (for those of you so disillusioned by the whole monotonous process, the date is May 6th), and there were clear signs of a dwindling interest in British politics, albeit a concrete block of brutal ignorance. This, however, wasn’t caused by the election campaign and its shoddy attempts at inspiring the nation through brand-spanking new PR, which wasn’t even in motion at the time. The earlier signs of political sedation were symptomatic of the active embitterment of the public; a dynamic dread for politics, psychologically bred by the sloppy dishonesty of its carriers, perfectly exhibited by the expenses scandal, was infused in the public conscience. Way to go Westminster. But at least on this nick in the political time line there was a freshness of hope beginning to bloom, much like the gracious arrival of spring after a bitterly Arctic winter. This magnanimous hope expressed itself in the form of an upcoming general election. As traditional political routine advanced, backed-up by official calls for the attention of the electorate to the forthcoming event, people and politicians alike (let’s not kid ourselves, politicians are closer to Daleks than humans) began milling about like moveable cogs, shifting from erstwhile inertia into some workable platform for electioneering. It was as if the starchy clouds of grave disappointment were finally starting to evaporate, blown westwards by the winds of change – signal the Scorpions song. But words like change and so many other hopeful expressions of cleansing authority have taken on a rather duller tone since those first few ignitions of excitement. The liveliness of the political pulse has been quelled by the dolorous juddering of the campaign machine; individual party models are available, each with their own unique modifications on circumlocution. After participating in some of the work of the party campaign trails myself, and enjoying it at that, I expected to be rising to the peak of the election wave right about now. But sadly I reached my optimum about a week ago, and my wave has been shrinking ever since. The reason is probably one others can indicate as well. Frighteningly magnified posters of candidates’ faces; strict and highly-strung TV debates with audiences who can’t respond in any sense; relentless leaflets with meagre promises printed all over paper you know could’ve been used for a more functional purpose. Yes, this is what an election campaign is all about – blowing every one of your fragile nerve-endings one-by-one until all that’s left is a blight of rhetoric and impulsive slogans where the brain used to be. 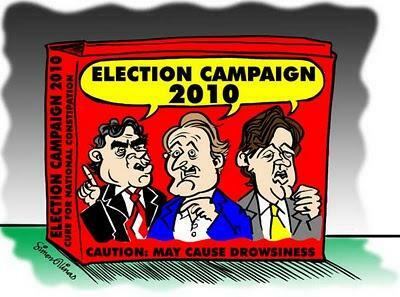 For me this campaign is no longer viable; it’s no longer alive, moreover. With just a mere 11 days left, that’s about 274 hours away as I’m writing this blog, the rivers of the calming campaign run neither red nor blue, nor yellow, but a lacklustre grey, reflecting the overcast state of the sky in Winchester at this precise time. I can imagine most peoples’ political persuasion and favour hasn’t been altered in these recent weeks by the range of instigation from the media, leaving a minority of undecided voters who may spontaneously make up their minds in the booths or on their ballot papers to be sent via post. We are constantly hearing from David Cameron that there is a “huge fight on our hands” – that’s speaking for the Conservative supporters – and from Nick Clegg that if you really want ‘real change’ you should vote Lib Dem. Brown appears to be bumbling along at a moderate pace behind the hornet drives of his opponents, much happier to just reaffirm what we already know about him: he’s smart, Scottish and stubborn. This election, in fact, will be the first I am actually allowed to pledge a vote for a party of my choosing, and I freely admit I’m still not 100% sure of who I’ll entrust my vote to. The state of affairs, though, is a banal one; if the politicians want to try to convince me any further that this is a life-changing election they’ll have to engage in a game of Russian roulette between the main candidates in order to emphasise the wretched imperative of government reform. To call a spade a spade, this election campaign is dead – at least it is to me. If this campaign were a form of physical deficiency it would be erectile dysfunction, because right now all I’m receiving are flaccid phrases and chesty coughs from the supposed saviours of the economic meltdown. They want a referendum on the voting system, I’ll give them one: just bloody well let us vote already!